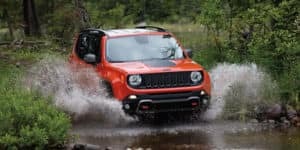 The 2019 Jeep Renegade may be small, but its compact size certainly comes in handy in the field of efficient maneuvering. It also has a responsive powertrain and debuts a lineup with four fashionable trims. With a group of user-friendly technologies and modern safety features in tow, it’s clear to see why this vehicle is an attractive choice in the SUV segment. Here’s what you can expect from the ever-capable Jeep Renegade. The base Sport features 16-inch steel wheels and adjustable side mirrors with available heating control. Climbing a tier up to the Latitude unlocks automatic headlights and fog lights, whereas the Limited and Trailhawk opt for a set of bigger running wheels. Nonetheless, all trims display a sharp and sculpted look paired with updated fascias and an available class-exclusive, removable My Sky sunroof panel that lets in a blend of fresh air and vitamin D.
The Sport and Latitude are fueled by a 2.4-liter Tigershark four-cylinder and nine-speed automatic transmission. Combined, these systems allow the Jeep Renegade to output 180 horsepower and 175 pound-feet of torque. The Limited and Trailhawk opt instead for a 1.3-liter turbocharged four-cylinder that churns out 177 horsepower and 200 pound-feet of torque. The unit also meets eco-friendly status, thanks to start-stop technology that helps it preserve fuel when idle. The Renegade has a few surprises in store for off-road enthusiasts. Despite its compact frame, the SUV is capable of handling trails and uneven terrain like a champ, and it does so thanks to a heightened crawl ratio, 8.7 inches of ground clearance, and its ability to ford 19 inches of water. It also pairs these performance perks with standard front-wheel drive or available all-wheel drive. The latter works well for the Trailhawk, a trim that also comes with enhanced low-range settings, a slightly raised suspension, and all-terrain tires for a smooth and consistently clean ride. You won’t have to splurge much to see a charming cabin. Even at the base level, the Renegade greets you with a height-adjustable driver’s seat, a tilt/telescopic steering column, and optional dual-zone automatic air conditioning. If you want to indulge in extra comforts, you’ll unlock plenty of these as you ascend the trim ladder. These include leather-covered seating surfaces, all-season floor mats, and LED ambient lighting. You can also make your road trip the most entertaining yet with the help of a tech-focused dashboard. This area comes standard with a 5-inch touch display and six-speaker audio system. However, you can upgrade to multimedia perks like a Uconnect infotainment system with 7- or 8.4-inch screen, GPS navigation, and smartphone integration for Apple and Android devices. The Jeep Renegade may be small, but its safety lineup is anything but. It starts with basics such as whiplash-injury-lessening seats, front side-impact and knee air bags, and an anti-theft system with engine immobilizer. What follows are optional upgrades ranging from an Advanced Technology Group to a Safety and Security Group. These packages introduce systems like automatic emergency braking, blind spot monitoring, and full-speed forward collision warning for peace of mind wherever you go. If you’re in the market for a compact SUV with big and bold surprises in store, look no further than the 2019 Jeep Renegade.